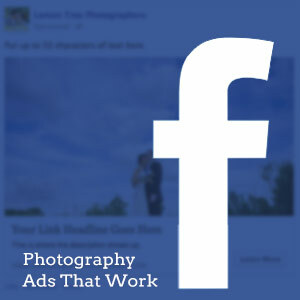 The majority of Facebook ads are a waste of money for photographers. Before you can create effective ads, you need to understand what makes them a waste of money so that you don’t keep throwing it away, hoping that somehow you’ll get a few clients somewhere. 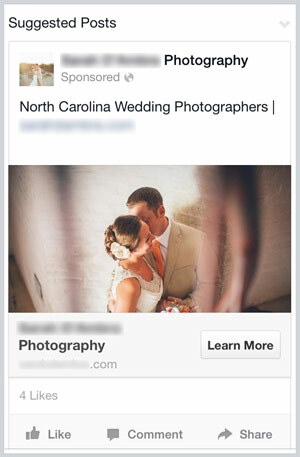 So let’s talk about the mistakes photographers are making with Facebook ads and what makes an ad get good results. Then I’ll give you a step-by-step method that makes creating effective Facebook ads easy. Paying for advertising is a fantastic way to get more people to hear about your business in a short amount of time. 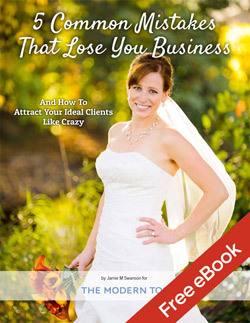 The more people who hear about your business, the more clients you are going to get. If they haven’t heard of you, they can’t hire you. However, as a professional photographer you have to do a lot of various tasks to keep your business running. There’s shooting, editing, client management, sales meetings, marketing, website design and management, networking with other vendors, and more. Effective advertising is complicated, and I found that most photographers don’t take the time to learn what really works before they jump in. So they try the easy stuff and end up wasting their money with very few results. You boost a post. You get a few more likes, comments, and maybe even a share or two, but you don’t get clients. You might even try creating an ad that is targeted to a specific demographic or type of person. These generally work better, but you only spend a few dollars and quickly quit when you don’t see many (if any) results. Here’s the problem with doing this. First, boosting a post could show it to anyone. More people will see it, but they may or may not be looking for a photographer right now. You have no way of knowing, so you could be wasting your money on it. Plus, it’s possible that your boosted post is getting shown to fake profiles, people in different countries who would never hire you, or worse. There’s tons of rumors (and some proof) that this is not a good way to spend your advertising dollars and that much of it may be getting wasted. Same thing goes for trying to get more likes on your page. They aren’t any good since Facebook hardly shows your free posts to them anyways, and who knows if they are actually potential clients. For example, on the right is an ad from a photographer that showed up on my phone’s news feed. I am in Minnesota, which is half the country away from them, I’m already married, and I’m not looking for a photographer at all. It only showed up because they paid for more exposure, as I don’t know them and haven’t liked their page. I’m not the type of person they want seeing it at all. So what about doing an ad that is targeted to people in your area, who fit certain demographics (such as being a certain age or with specific interests)? This is better, but you still don’t know for sure if they’re actively looking for a photographer. On top of that, if they only see your ad once, they may not have any brand recognition or feel that it appeals to them, so they simply ignore it. You waste less money with targeting by interest and demographic, but you still aren’t seeing the results you want. So why aren’t you seeing the results you could be? 1. Your ads aren’t being shown to people who are actually looking for a photographer like you in your area right now. 2. Your ads may not appeal to the people they are being shown to. 3. The people seeing your ads may not have any brand recognition with your business, so they don’t trust it enough to click. 4. You don’t have a clear objective for your ads. 5. You need to be more specific (I’ll explain this more in a moment). What makes a Facebook ad effective? In order to make sure your ads are effective, there’s a few things you need to understand. First, the more people are familiar with your brand and your website, the more effective your ads will be. So you will have much better results by advertising to people who have already heard of your business or visited your website than by just advertising to some random person who has never heard of you. Second, the more relevant your ad is, the more likely you’ll be to get results. For example, have you ever been shopping around for a product online, and then suddenly it starts showing up in ads you see around the internet? Those ads are going to get better results for you than if they simply showed you some random product, because you’re already interested in purchasing it and are looking to buy that kind of product. Sometimes people need to see something several times before they buy. They may be undecided at first, or maybe their kid is making a fuss and they simply can’t finish checking out and have to come back to it later. There are lots of reasons that people don’t make a purchase in a given moment, so giving them reminders afterwards is extremely effective in getting more sales. Third, you need to make sure you know what you want people to do after they click on your ad. If you want them to book with you, tell them that or encourage them to do that. If you don’t have a clear goal in mind, you can’t track if it is helpful or not. Simply promoting a photo on your site and hoping someone decides to hire you while they are there without telling them to do so is kind of like hoping your 5 year old makes his bed in the morning without you telling him to. He might, but it’s very unlikely. Tell them to do something, and it is much more likely to happen. Know what you want them to do, and then tell them to do that. Be clear and specific. Fourth, test everything to see what works best. I know, you don’t have time to do this and have no idea how to do it. But it doesn’t take long, and thankfully, Facebook makes this easy for us to do. But I’m getting ahead of myself…. Finally, it’s important to know that the more specific you can get with your ads, the less they tend to cost. If you can create super-relevant ads that are only shown to the people who are genuinely interested in your business (and you can prove that), you’ll pay less. This is because you’ll get great results without them having to show the ad to people who don’t care. Less money spent means more money in your pocket and a better return on your advertising. That’s nice, but HOW can I actually do this as a photographer? We’re going to tell Facebook to ONLY show ads to people who visit your website. That way you know they are interested and have heard of you. Not only that, but we’re going to set up separate ads for the different kinds of people who have visited your site. For example, if they only checked out the blog post from their friend’s wedding, you can use a photo from that friend’s wedding and advertise a link to the online proofing gallery (aff link) and encourage them to check it out and buy prints. Hello extra print sales! Or, let’s say they checked out several pages on your website and then inquired with you. You’ve sent them information back, but they haven’t responded yet. You can create a specific advertisement just for these people encouraging them to book now and reserve their photo session or wedding date before someone else does. Or maybe you posted a link to some mini-sessions you’re offering. They checked out the page on your website, but they never inquired. You can keep advertising your mini sessions just to the people who already checked it out until they’ve all booked up. Because you’re only advertising to people who have visited your site recently and you’re able to be super-specific and relevant with the ads, it’ll cost you less and you’ll get much better results from them. And the best part is? You can completely automate it so that once you’ve created the ads you want to show, you don’t have to add or remove people to it or anything. Facebook tracks it all for you and shows the right ads to the right people. The strategy is super effective, and the implementation is not nearly as difficult as you think. Then, don’t forget to put it into practice and start seeing results! Know someone who might find this helpful? Please click the share buttons below or send them a link to this post to share with someone you think would find it helpful. I’d appreciate it a lot, thanks!